Director of external affairs for Google, former Editor at Fortune, & author of The End of Suburbs, & The Airbnb Story. As one of the top editors of Fortune and a 20-year veteran of reporting on the key players, companies, successes and scandals of American business, Gallagher paints a compelling picture of how digital disruption, demographics, and seismic economic and cultural shifts have converged to bring more change to Big Business in the last decade than anytime since. Blending a keen eye for connecting the dots and identifying bigger-picture trends with a journalists’ ability to spin research and reportage into memorable examples and entertaining anecdotes, Gallagher identifies the forces and challenges driving the new world of business and delivers valuable takeaways for leaders across industries on how to rise to meet them. 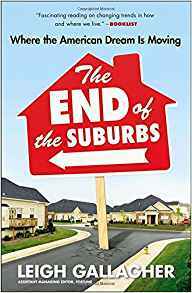 In her first book, The End of the Suburbs: Where The American Dream is Moving, Leigh Gallagher documented one of the most profound social changes to hit our country in a generation: a growing dissatisfaction with, and movement away from, American suburbia as we know it. Weaving together ample data and evidence with rich history, her own personal narrative, on the ground reporting and lively anecdotes, Gallagher paints a compelling picture of a shift toward downtown, village-oriented lifestyles—whether they be in cities or in suburbs—as well as the ramifications of that shift on the economy, on individuals, and on big business, whose real estate, headquarters, retail and other decisions have pivoted as a result. In this fascinating, informative, and entertaining exploration of where we live and why, Gallagher demonstrates why the post-suburban-sprawl future is not a bleak one but a better one. Renting out space in your house for the night to strangers—what could be more certain to fail? That’s what the founders of home-sharing platform Airbnb were told by investors in 2007. In captivating detail and with plenty of humor and color, Gallagher takes audiences behind the scenes for the inside story of how three broke, unemployed college grads stumbled upon their billion-dollar idea and became one of the biggest Silicon Valley success stories to date—now claiming 200 million trips, a $31 billion valuation, and having transformed the way we travel and the way we view space. 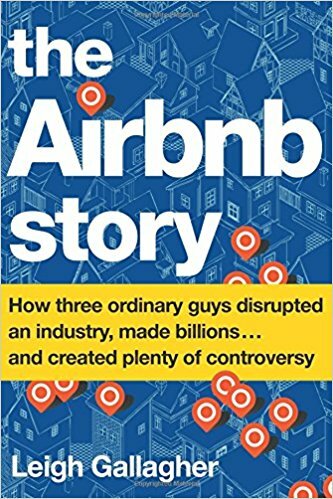 Gallagher traces the history and growth of Airbnb within the context of the so-called sharing economy; explores the many controversies the company faced along the way; and describes the leadership journey of the three founders–especially the company’s CEO, Brian Chesky, an art student with no previous experience in business. Gallagher extracts compelling observations and lessons for organizations of all kinds from this rags to riches Silicon Valley success story: how seeing old ideas in new ways can lead to breakthrough ideas; the social, demographic and economic factors that created the conditions for Airbnb to strike a chord; for incumbent industries, how to be prepared for digital disruption likely to come from where it’s least expected; and, for anyone, the importance of persisting when others say an idea will never work. As a top editor at Fortune magazine and a co-chair of the Fortune Most Powerful Women Summit, the exclusive, invitation-only gathering for the top women CEOs and leaders around the world, Gallagher has unrivaled access to the fast-growing group of women increasingly running the world’s largest organizations and some of its most influential startups. She explores the role of women in business today and how it’s changed, both from her own observations and by charting the makeup of Fortune’s Most Powerful Women franchise over the years. She marshals data, evidence and compelling examples to demonstrate the ways in which women lead differently—from decision making to negotiating to strategizing to thinking—and why those differences are precisely what have led women to make such gains in recent years. She also explores the work still to be done, from eliminating the pay gap to removing gender stereotypes at childhood to addressing the alarming persistence of sexism in the workplace—most recently, the shocking revelations of harassment, sexism, and discrimination coming out of Silicon Valley. She concludes on an uplifting note, sharing words of advice from some of the most successful women in business for women at all stages of their careers. Leigh Gallagher is a director of external affairs for Google, and former Editor at Fortune. She is the author of The End of Suburbs, and The Airbnb Story. Her first book solely focused on the origins and growth, color and controversy of the $30 billion disruptive “home-sharing” startup, The Airbnb Story has been called “an engrossing story,” a “must-read,” and has been named a highly-anticipated book of 2017. Leigh is also the author of The End of the Suburbs: Where the American Dream is Moving, published in 2013 and described by the New York Times and others as “prophetic,” “a first-rate social history” and “a steel fist in a velvet glove.” In her role as Assistant Managing Editor at Fortune, Leigh writes and edits feature stories, helps steer the publication’s editorial direction and oversees its annual “40 Under 40” list. She is a co-chair of the Fortune Most Powerful Women Summit and the executive director of the MPW Next Gen Summit. From 2014 through 2016 Leigh was the host of Fortune Live, Fortune.com’s weekly 30-minute video show featuring one-on-one interviews and roundtable panels with CEOs, entrepreneurs and other leaders from the business world. Leigh is also a seasoned on-air commentator, appearing regularly on MSNBC’s Morning Joe, CBS This Morning, CNBC’s Squawk Box, CNN and a variety of other outlets; she can be heard every other Friday on the “Weekly Wrap” with host Kai Ryssdal on public radio’s Marketplace. She is a frequent moderator and keynote speaker at Fortune and other business and economic conferences. Leigh is a member of the Council on Foreign Relations and a past visiting scholar at the Business and Economic Reporting program at the Arthur L. Carter Journalism Institute at New York University. Originally from Media, PA, she is a graduate of Cornell University and lives in Brooklyn, New York.